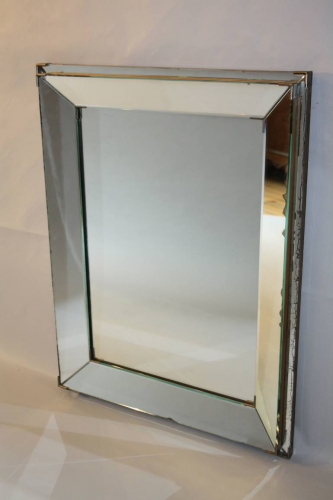 An unusual mirror with stepped outer border. French c1950. There are some small areas of mirror loss around the outer edges of the glass border but this does not detract from the piece overall. Clean central plate. No breaks or chips to glass. All in original condition. Can be hung portrait or landscape. Perfect for a bathroon or above a dressing table but with such a simple and elegant design it can be placed almost anywhere.